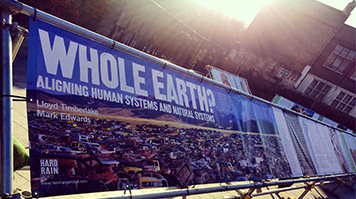 On Wednesday 19 October, LSBU held a launch event to celebrate its hosting of the Whole Earth? photography exhibition. More than 70 staff and students came to the launch event to hear how LSBU is using the exhibition as an opportunity to drive awareness of sustainability issues on campus and beyond. The exhibition, organised by the Sustainability Team and to be hosted at LSBU’s Clarence Centre until March 2017, aims to deliver a set of sustainability messages, raise questions, and create a debate through the medium of photography to make students, university staff and the general public aware of the critical role they play in creating a more sustainable society. Launched in autumn 2015 at the Eden Project, the exhibition is a partnership between Hard Rain Project, the National Union of Students (NUS) and the Environmental the Association of Universities and Colleges (EAUC). It is hosted by universities and schools in the UK and Scandinavia, and is based on the premise that the future belongs to today's young people. At the heart of the photography display are 20 questions which address a range of university subject disciplines, and challenge the viewer to consider how they can support global sustainability to create a more resilient, healthy and just society - giving students and their tutors the opportunity to express the kind of world they would like to live in. The ultimate goal of Whole Earth? is to raise awareness of sustainability issues and present the evidence that students need to help them join the debate about their future. Professor Pat Bailey, Deputy Vice Chancellor at LSBU, said: “Here at LSBU we are committed to weaving sustainability into all aspects of university life. LSBU is using the framework of ‘The 3Cs’ to drive sustainability change across our organisation; Campus, Community and Curriculum. “Already we are efficiently reducing energy and water use, promoting recycling, purchasing goods and services with the best social and environmental impacts, and working with our local stakeholders on sustainability projects, to name a few. Following his speech at the launch event, Prof. Bailey gave two tasks to the assembled group. He said, “Firstly, if you're inspired by this exhibition, find a way to incorporate it into your university work and daily life. Secondly, bring along at least three people to the exhibition, to spread the awareness of the worldwide sustainability issues that we all face”. The Whole Earth? exhibition will remain at LSBU until March 2017.